Practical Research 11 Edition Note: This is the bound book only and does not include access to the Enhanced Pearson eText. To order the Enhanced Pearson eText packaged with a bound book, use ISBN 0134013506 . 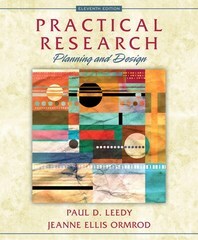 Engaging and cross-disciplinary, Practical Research: Planning and Design is a do-it-yourself, understand-it-yourself manual for planning and conducting research. Suitable for a wide variety of courses in basic research methodology, the text guides the reader, step-by-step, from the selection of a problem, through the process of conducting authentic research, to the preparation of a completed report, with practical suggestions throughout. The authors emphasize the idea that quality research demands planning and design, and they provide what is needed for readers to be able to execute their own research projects effectively and professionally. Improve mastery and retention with the Enhanced Pearson eText* The Enhanced Pearson eText provides a rich, interactive learning environment designed to improve student mastery of content. The Enhanced Pearson eText is: Engaging. The new interactive, multimedia learning features were developed by the authors and other subject-matter experts to deepen and enrich the learning experience. Convenient. Enjoy instant online access from your computer or download the Pearson eText App to read on or offline on your iPad® and Android® tablet. * Affordable. The Enhanced Pearson eText may be purchased stand-alone or with a loose-leaf version of the text for 40-65% less than a print bound book. * The Enhanced eText features are only available in the Pearson eText format. They are not available in third-party eTexts or downloads. *The Pearson eText App is available on Google Play and in the App Store. It requires Android OS 3.1-4, a 7” or 10” tablet, or iPad iOS 5.0 or later.